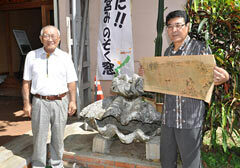 Hideo Nakamura (left) contributed a giant clam weighing over 200 kilograms to Nago Museum. Nago City Assembly member Masaki Kamiyama liaised between Nakamura and the musuem. At Nago Museum on August 31. Eighty-four-year-old Hideo Nakamura used to conduct submersible surveys in various areas in Okinawa as an engineering official at the University of the Ryukyus. Nakamura contributed a 200 kilogram giant clam, barrel sponges and fishing gear to Nago Museum on August 31. He collected the clam in the sea off Kudaka Island and the barrel sponges in Oura Bay. Barrel sponges are a barrel-shaped invertebrate organism. They take in nourishment by continually pumping water through the interior of the sponge. They are 45 centimeters wide and 35 centimeters high. The clam is 114 centimeters wide. It takes four adult men to lift it up. Nakamura found the clam and sponges during his submersible surveys in the 1980s. He also gave sinkers for drive fishing and tide tables to the museum. The fish disappeared in the sea around the Motobu area of Okinawa due to the naval bombardment by the U.S. military in the war. Around 1947, Nakamura and others carried a sabani boat down from the hills and fished in the Henoko and Higashi Village areas. Nakamura said, “The sea off Henoko and the east coast of Okinawa is rich in marine life. I want the people of Nago to understand this.” The museum displays the clam beside the front door so visitors can easily see it.